Where should my cat sleep? Wondering why your cat sleeps so many hours a day? If you're a cat owner, it will come as no surprise to you that your moggy loves sleeping. Domestic cats sleep for 12-18 hours a day and will often find the strangest place to curl up in- whether that means a spot next to the radiator, or on a pile of fresh washing! On average, cats spend about 16 hours a day sleeping. Cats rest or sleep intermittently throughout the day and often prefer to sleep in a warm, comfortable and safe place. A cat's need to sleep is a result of evolution, nutritional habits and physiology. In the wild, cats have to hunt in order to eat and the stalking and chasing of prey burns a lot of energy. Sleep allows energy resources to be replenished - vital for a predator. 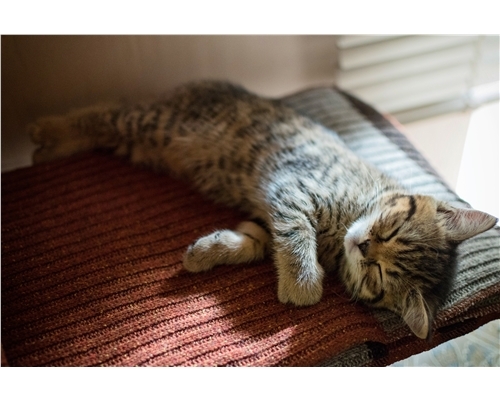 Cats will generally take a nap where they want to, as long as the place they're settling in is warm and comfortable. There are a range of cat beds available, such as igloo beds or hammocks for the radiator, or you could provide a cardboard box on its side with a soft blanket inside. You can find out more about what to provide for your cat in our welcome home guide. You'll find that cats often rotate their preferred sleeping area and they shouldn't be disturbed when sleeping. When a cat falls asleep on their owner's lap, they often don't realise that the cat is asleep and continue to stroke them. Most cats will be aware of what is happening, but some might be sleepy and disorientated and react defensively to a percieved threat.